Have you ever looked up at the night sky and just wondered? Tonight I wondered just how far away Heaven must be. I do! I don't think Heaven is as far away as it seems. I love you! With God, anything is possible and all is just the right way, distance, etc. Remember though, we'll be there in the blink of an eye! 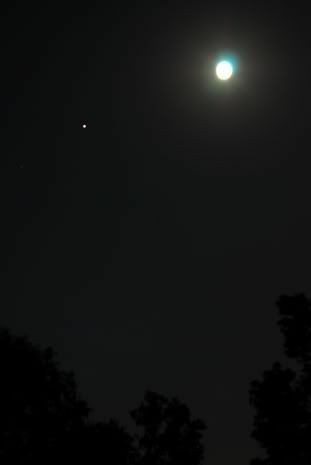 (((HUGS, Marsha)))) Is that a picture from last night with Jupiter near the moon? We had cloud cover last night, and I couldn't see it. I love that picture! It was my view last night as well! :) God is good! :) I can hardly wait to go to heaven! Isn't there a scripture that says heaven is on earth...we just can't see it? Well I am pretty sure that is not what you meant...I will just blame this post on being tired. In earthly terms, heaven is very, very far away. In God's terms (which is the way I will get there) it is only the blink of an eye away!! If you are lost without Christ, it is an eternity away!! Yes...as I age heaven becomes more real and closer somehow. Absolutely! Everytime I look at the sky, night or day, I think about heaven and the awesomeness of it all and one day being there. I love the picture! I've wondered the same thing before. Whenever I start to wonder and look at the stars it makes me panic because it all seems so HUGE and big and freaky. But thanks be to God that he gives me peace that passes any man's understanding....that I can have peace while looking at the expanse is really astonishing. Lovely picture...is there symbolism in it? And I look up and wonder when He'll get here. Now would be a good time. tonight i wondered what planet is beside the moon (you took the picture i saw tonight). it is jupiter. I wonder how far away it is and I hope and pray it won't be long before we get to find out! I accidentally stubbled across your blog about a year ago via a link from another blog. I wanted to let you know that your faith is such an inspiration. Your words are beautiful and brave. Your ability to see the positive and focus on the bigger picture is amazing. And you inspire me to be a better mother and a stronger follower of Christ. Your boys are blessed to have you as a role model in their lives. And you have blessed the life of this total stranger. Thank you. I don't think of it in terms of distance, but how much longer? When we as Christians complete our God given assignments and fulfill our callings, that is when the wait will be over. I thank you Lord that I hear your voice, use me I am Yours.